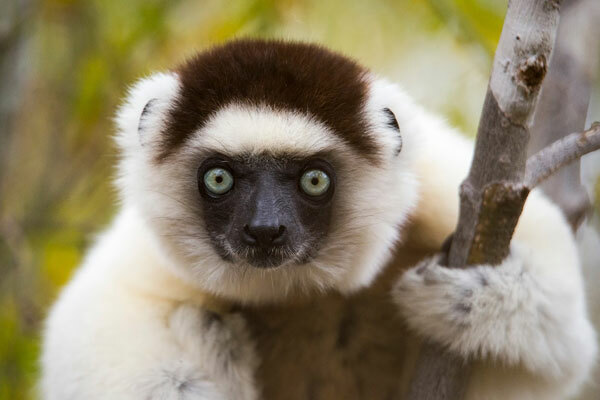 Lemurs are found only in Madagascar. 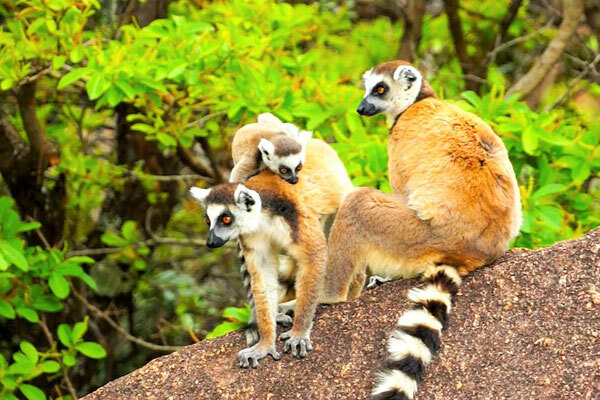 They enjoy the island’s diverse habitats which support over 100 species and sub-species of lemur. Some of them thrive in the forest regions while others do extremely well in hot deserts found elsewhere in the country; they all consume fruits, flowers and insects. 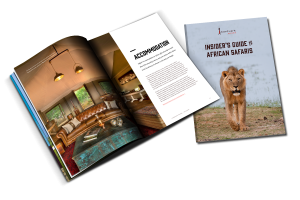 Here are some of the species of lemur you are likely to encounter on a safari in Madagascar, and the lodges and camps in which you can base yourself on your holiday. The one from the movies. With iconic black and white bands circling its tail, the ring-tailed lemur is the one loved by Disney cartoons and the model for hundreds of magazine covers featuring Madagascar. Living in groups of up to 30 with a mix of males, females, and youngsters glued to their mum’s backs, they are gregariously social and impossibly cute. Find them lounging about in the trees or foraging for food in the south of the country. There are 15 luxuriously large tents at Tsara Camp, each with a wooden floor, private shower and hand basin. They are arranged around the thatched central dining tent in which simple local meals are served. Walking is the main activity at Tsara Camp and there are two small forests within a short distance, both suitable for two to three hour walks. Day or multi-day walks are also possible, although the heat during many months means an early start. Measuring nearly 4ft (1.2 m) and with long limbs and an upright body, the Indri are known locally as ‘babakoto’, meaning ‘man of the forest’. Their similarity to humans isn’t just superficial either – they also mate for life, live in groups of two to six and form families that can last generations. The Indri are best known for the noisy, haunting calls they use to communicate. You can hear the distinctive whale-like song at dawn as the mist lifts over the forest canopy. 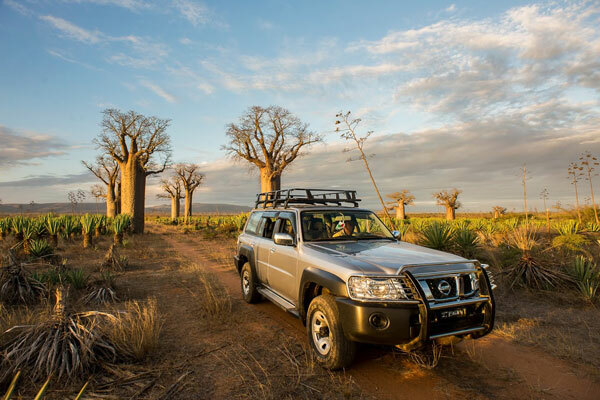 Read about Richard’s experiences of tracking down an Indri Indri in Madagascar. Each of the 28 bungalows at Vakona Forst Lodge has an en-suite bathroom. There is a swimming pool, central bar and dining area. 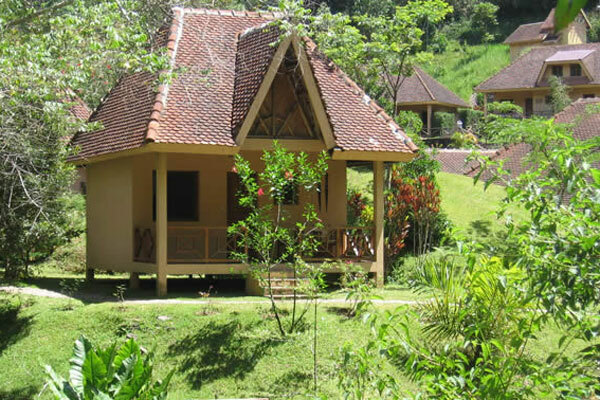 Guests staying here can explore the nearby Andasibe (Perinet) and Mantadia National Parks. 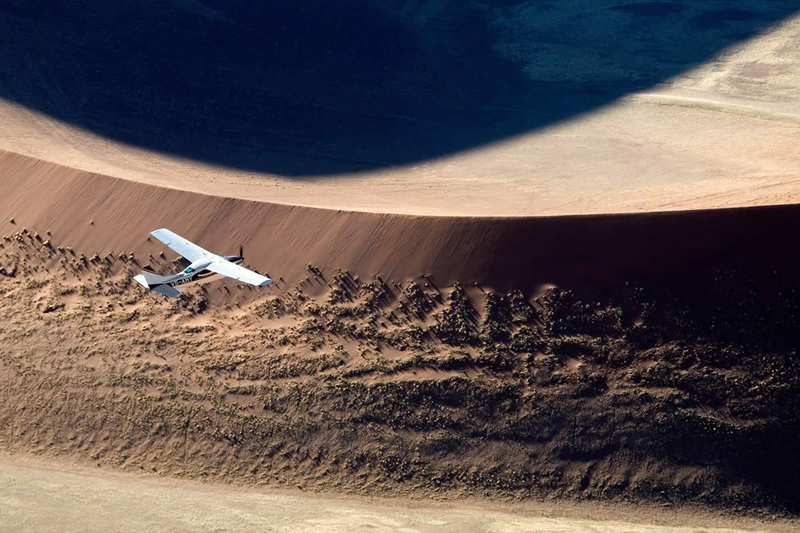 Accompanied by a driver and local guide it’s possible to explore these famous reserves on foot, both by night and day. Andasibe National Park is renowned for its variety of diurnal and nocturnal species, know for the Indri Indri. 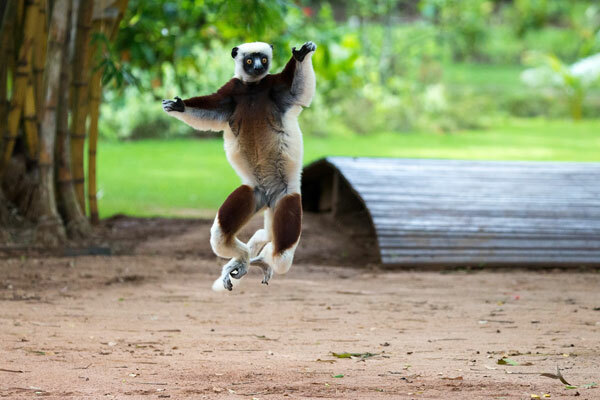 While they might live in the trees, the Verreaux’s Sifaka save their best moves for the ground. The two legged hop they use when sashaying across open ground wouldn’t look out of place on Strictly Come Dancing. They also enjoy clowning around with each other in the tree canopy. As happy in the humidity of the rainforest as they are in the dry forests further west, this is Madagascar’s most entertaining lemur. 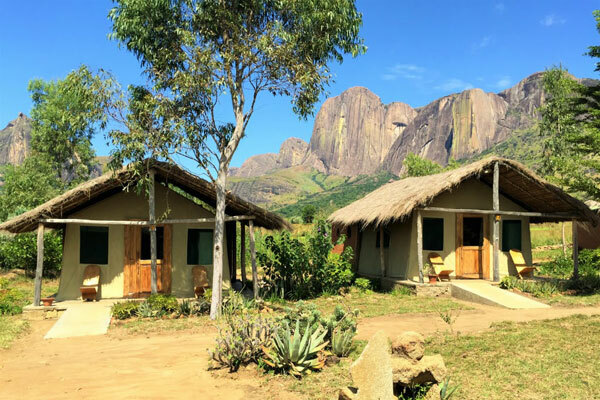 Mandrare River Camp is set in the grounds of an old colonial plantation house opposite the sacred ancestral forests of the Antandroy tribe. 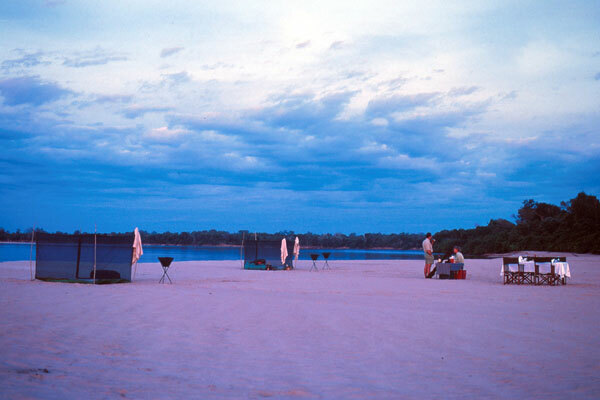 It has six large tents, each with en-suite facilities with a flush loo and a shower. All the tents have a verandah overlooking the river. There’s a terrace right on the Mandrare River’s edge on which you can relax in the middle of the day or sit with some binoculars enjoying the fantastic bird watching. 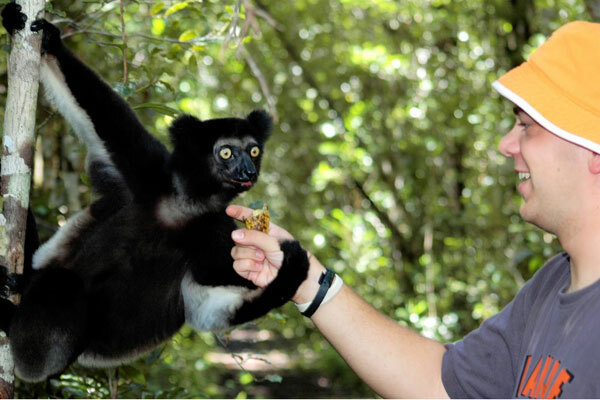 There are a number of activities including day and night walks to find the five species of lemurs present here. Also there is astronomy, and meeting and interacting with the local Antandroy tribe. Coquerel’s Sifaka live in groups of three to ten. Mainly active during the day but they also can also be spotted at night. They live in dry forests along the coast, either in northern and eastern parts of the Besiboka River and the southern part of the Ambato-Bobni. Making soft chattering noises they have an upright posture, a position they sometime adopt even when sleeping. 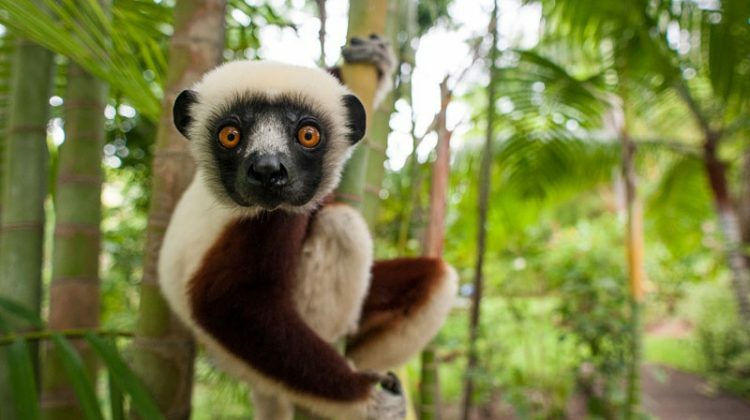 Coquerel’s Sifaka have started crossing open spaces on the ground more often as their natural habitat is disappearing. 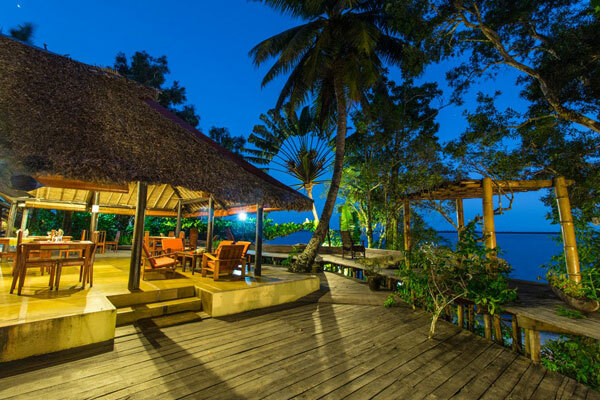 Anjajavy has 25 rooms spread along the beach, each designed with dark palissandre wood, air conditioning and en-suite facilities. The hammock on the verandah is a great place to enjoy a view of the beach and generally relax. The bar and lounge are convivial places to meet other guests and the dining room with a verandah are great spots to enjoy Anjajavy’s fabulous food. 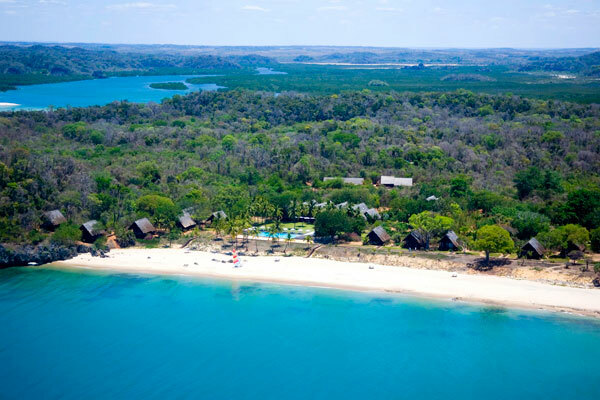 Among activities on offer here are sailing, snorkelling, windsurfing and canoeing, as well as big game fishing. 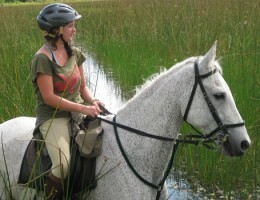 Other excursions include such as guided walks, village and market visits and 4×4 trips. Of all the lemur species this is the smallest weighing a mere 2oz (57g) when fully grown. 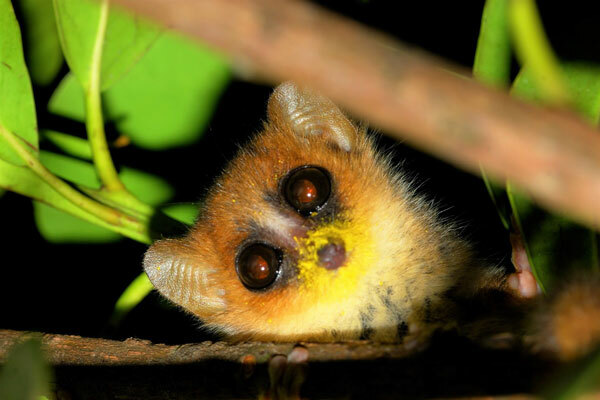 Nocturnal, and living their entire lives up in the trees, their large eyes that help them adjust to the darkness. They use holes in trees to create nests and while they don’t live in families like so many other lemur species, they tend to sleep in groups during the day. They can hibernate for a couple of months in the dry season. The Bush House is hidden in the forest and offers excellent views from its hillside location. Much of Bush House is hand-built from local materials. Each of the 11 en-suite bungalows and two rooms are different. 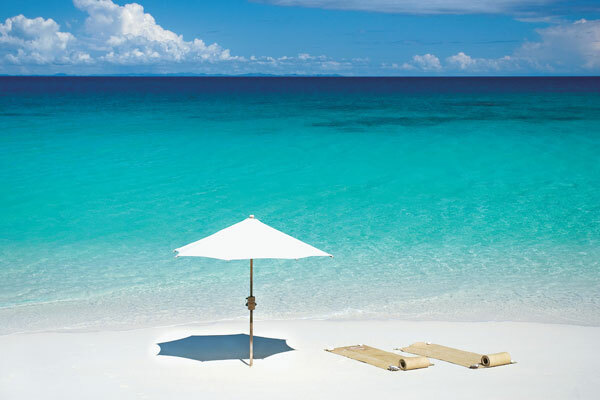 There is also a bar and restaurant, where the menu includes traditional Malagasy, Creole and French dishes. Guests at Bush House can explore the beautiful unspoilt surroundings on foot or by boat, or walk in the nearby private reserve to see some of the species protected there. These include crowned, red-bellied, ring-tailed and black and white ruffled lemurs as well as chameleons and radiated tortoises. Some water based activities are also available, including canoeing.